Udupi, Dec 2, 2015 : A female elephant of Sri Krishna Mutt/Temple, which used to participate in festivities, was sent from here to the elephant camp at Sakrebail in Shivamogga district for medical treatment on Dec 1. The female elephant, named Subhadra and aged 22, was suffering from pain in its leg. Veterinarian Vinay S. from Shivamogga was coming here for the last two months to treat the elephant. Since the elephant required daily medical attention, the mutt obtained permission from Udupi and Kundapur Range Forests to send it to Sakrebail. According to the officials of the Forest Department, the elephant was expected to be back here after treatment on January 10. An attempt was made to take Subhadra to Sakrebail on November 26. But the elephant refused to get onto the truck. Hence, two elephants were brought from the Sakrebail elephant camp to persuade Subhadra to go to the camp. The two elephants and the personnel of the Forest Department managed to get Subhadra onto the truck. 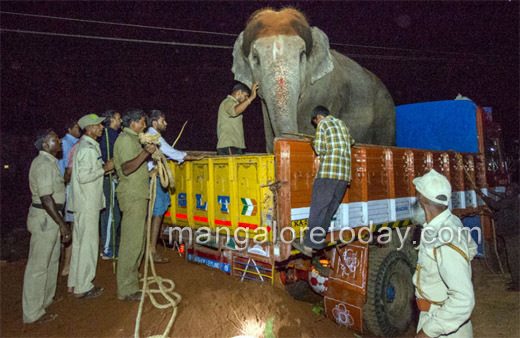 The manoeuvring to get Subhadra onto the truck from the Sri Krishna Mutt took place in the early morning and took some time. Even the animals need a company, it did not agree to go onto the truck alone. So nice of that elephant. The people are selfish compared to animals. Lucky Elephant. So cute, Usually animals are more loving than humans.